From my personal experience, omega-3s have helped me tremendously with dry skin (especially in the winter) and clarity of my mind. Once I integrated omega-3s into my diet, I noticed significant changes within weeks. There is no reason why you shouldn’t get the same benefits. With an adequate intake you can improve the appearance and health of your skin, prevent Alzheimer’s disease, and much more. In health coaching, I highly recommend everyone to check if they are getting enough omega-3 fatty acids. This article will help you begin to understand how to get enough omega-3s in your diet and why it is worth your effort (and money). Omega-3 fatty acids are polyunsaturated fatty acids that are essential for your health and wellbeing. When our body needs a particular nutrient that cannot be manufactured by the body, it is considered an essential nutrient. Since Omega-3 fatty acids are essential nutrients that help the body with many functions and deliver several health benefits, it is important that you include sufficient omega-3 fatty acids in your diet whether it is through food or dietary supplements . Omega-3 fatty acids are commonly identified based the foods they reside in: alpha-linolenic acid (ALA) is found in plant based sources and both eicosapentaenoic acid (EPA) and docosahexaenoic acid (DHA) are found in certain fish products. When ingesting ALA, the body must convert it into EPA and DHA (useable forms). This conversion, however, is not very efficient. This inefficiency explains why fish products are the most common recommendation for omega-3 fatty acid consumption. Since fish are high in EPA and DHA, no biochemical conversions are required, thus it is more efficient. One study suggests approximately 8% of dietary ALA is converted into EPA and only 0-4% to DHA . Fear not vegetarians & vegans, there is one dietary supplement that you can take that does not compromise your dietary choices–krill oil. Krill oil contains DHA and EPA so there is no need to worry about “how much omega-3s do I need to get if I am only consuming ALA.” This omega-3 dietary supplement, along with others, will be discussed in the next article. Omega-3s have also been claimed to reduce the body’s production of inflammatory compounds which are correlated to many inflammatory-related conditions such as rheumatoid arthritis. 1. Because omega-3s improve cell membrane health, getting an adequate intake can improve the health of your skin, combat acne, eczema, psoriasis, or dry/flaking skin . 2. Some studies have revealed that omega-3 fatty acids can help lower depression and also boost the effectiveness of antidepressants . 3. DHA alone has been shown to lower blood fat (triglycerides)–high triglyceride levels can elevate one’s risk for developing heart disease . Omega-3s reduce the overall risk of mortality and heart attacks (myocardial infarctions); particularly with fish oil supplements . 4. Omega-3s have been shown to protect against the development of Alzheimer’s disease . 5. Omega-3s are essential for an infant’s brain development: the current recommendation is that pregnant or nursing women should consume at least 8oz of seafood per week but no more than 12oz due to concerns with mercury . 6. A recent study suggested that omega-3s can significantly reduce the symptoms of dry eye syndrome . 7. Omega-3s have been found to be moderately effective for relieving symptoms of rheumatoid arthritis. Furthermore, when taking omega-3s, people with rheumatoid arthritis noted a decreased need for anti-inflammatory drugs (such as Ibuprofen)  . There are other alleged benefits of omega-3s, but the results are mixed and therefore not included in this list. *It is important to mention that you should never attempt to treat your own conditions with this information, it is always important to consult your doctor first because omega-3 supplements can interfere with the absorption of some medications and in rare cases cause mild side effects. Where Can I Find Omega-3 Fatty Acids to Get the Health Benefits? With this figure, you can easily see some of the foods that contain a considerable amount of omega-3 fatty acids. I have included both plant-based sources and animal-based sources to reveal that anyone can get omega-3 fatty acids through their diet. If none of these numbers make sense to you, it is OK, you are not alone. 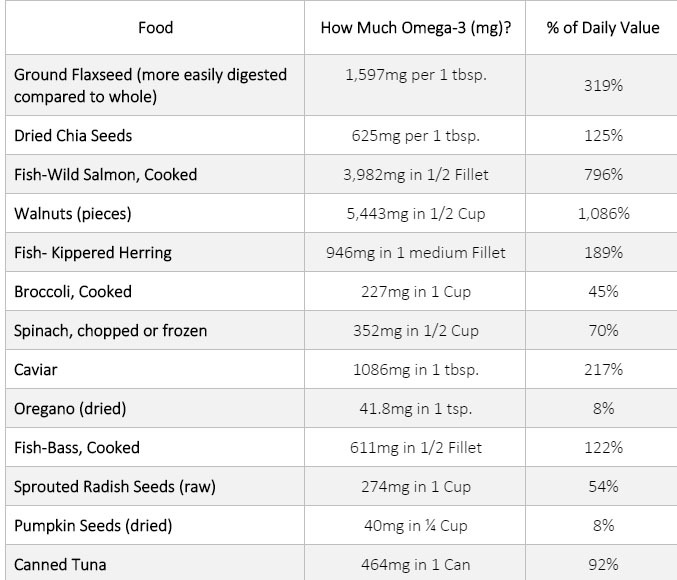 To make more sense of the chart, look at the column to the right labeled “% of Daily Value”–if you are going to pay attention to anything in this chart, pay attention to this to get a feel for how much the given item satisfies your daily omega-3 requirement. The daily intake recommendation for omega-3 fatty acids is 500 mg or 3,500 mg a week for maintaining your health. Many experts suggest that people should consume two fatty fish meals per week. You now can see why they suggest that (if you have no other sources of omega-3 fatty acids) because two 1/2 fillet servings of wild salmon, for example, equals out to be 7,964 mg of omega-3 fatty acids. This is more than enough for your weekly quota of omega-3 fatty acids. Use this chart and the link provided below to modify your diet so you can get sufficient omega-3 fatty acids on a daily basis. Remember: never over-consume one food or too much omega-3s, the key to health is balance (yin and yang). Omega-3 Fatty Acids can be found in many food sources. In this table below you can see some top foods that contain the highest levels of omega-3 fatty acids . If you do not think you can acquire enough omega-3 fatty acids with diet alone, you may want to consider omega-3 dietary supplements to easily meet your daily requirements. If you are considering this approach, you are not alone: approximately 37% of Americans are estimated to take or have taken omega-3 dietary supplements at some point in their life . You need to be sure to carefully select which brand and type of omega-3 dietary supplements you use because there are many brands that do not meet quality standards. 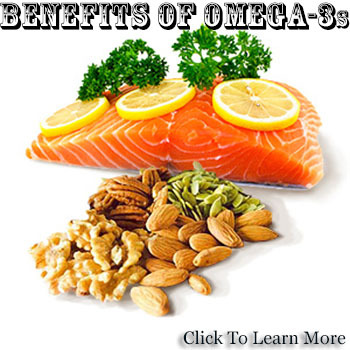 Furthermore, there are many other considerations when electing to take omega-3 fatty acid supplements. The next section in this article series will fully explain omega-3 dietary supplements, the different types, quality considerations, using omega-3 fatty acids as a treatment/therapy, and their potential side effects. In the meantime, I will introduce you to two quality brands that I use for myself. When I worked under a naturopathic doctor, I acquired a solid understanding of what to look for in quality fish oil supplement brands (e.g., purity or absence of heavy metals). Here is what I use (the brand has high quality standards). The one on the left is definately higher quality and contains vitamin D (wich is helpful during the winter if you are not already taking vitamin D or a multivitamin), but if you are low budget the product on the right will work too. Comment below with your experiences with omega-3 fatty acids and how you plan or how you implement them into your diet. 9. Foods highest in Total Omega-3 fatty acids. (n.d.). Retrieved from http://nutritiondata.self.com/foods-000140000000000000000-1.html?